The Danish eHealth Observatory is one of the most important eHealth conferences in Denmark. REACTION partners plan to demonstrate REACTION services such as the GlucoTab, the Nutrition App, the multi-protocol patient gateway, ePatch technology and glucose sensors. Partner IN-JET has also had a paper accepted for oral presentation on the need for revised care models when incorporating telemonitoring. The EHG conference, IEEE Internatinal Conference on eHealth and Bioengineering, is dedicated to e-health systems, medical bioengineering and biomedical engineering. REACTION partners have submitted a conference paper which was accepted for oral presentation. Title of the paper: First Results about the Use of a Patient Portal by People with Diabetes in a Rural Area. Authors: Dimitris Manousos, Franco Chiarugi, Vasilis Kontogiannis, Ioannis Karatzanis, Angelina Kouroubali, Emmanouil G. Spanakis, Kostas Marias, Joanna Fursse, Shona Thomson, Russell W. Jones, Vivek Verma, Malcolm Clarke. REACTION will exhibit at Medica 2013 which is the world's largest medical marketplace. The REACTION booth can be found in the CTIA pavillion in Hall 15. REACTION is planning a full-day workshop session for business managers on the practical challenges of implementing telemedicine solutions. Based on the global diabetes epidemic, REACTION has invited interested stakeholders to a workshop to discuss the reason why it is so difficult to agree on the opportunities and threats of disruptive technologies and applications. Participants will look at the possibilities and challenges of implementing telemedical solutions as well as exchange views, opinions and visions for future developments in the healthcare domain. Presentations will be made by key stakeholders from different health and research organisations as well as from private companies and will include topics such as sustainable business models, health technology assessment, ethical and product liability issues as well as the EU Medical Device Directive. Results from the REACTION project will also be demonstrated. The conference is the premier international conference on research related to representation, inference, learning and decision making in the presence of uncertainty within the field of Artificial Intelligence. REACTION partners FORTH have submitted a paper which has been accepted for publication: "Scoring and Searching over Bayesian Networks with Informative, Causal and Associative Priors". Partners MUG and MSG has a peer-reviewed abstract accepted called "Efficacy, Usability and Sequence of Operations of a Workflow-integrated Algorithm for Basal-Bolus Insulin Therapy in hospitalized Type 2 Diabetes Patients". The American Diabetes Association's Scientific Sessions brings together scientists and health care professionals from around the world who are involved in diabetes research and care. The five-day meeting will feature the most timely and significant advances in the prevention, diagnosis, and treatment of diabetes. The program is organised into eight distinctive theme areas and includes presentation by world-renowned diabetes experts. Reaction will be represented at the Danish conference aimed at municipal and regional healthcare and social care staff. Partners DELTA and IN-JET will be exhibiting in adjacent booths and MSG will be demonstrating the GlucoTab. As part of Reaction demonstration activities, some hospital visits will be arranged on 5th and 7th June. REACTION partners MUG and MSG have prepared a workshop presentation: Entscheidungsunterstützung im Klinikalltag – Erfolgsstory eines Software Medizinprodukts. ATTD 2013 is the Sixth International Conference on Advanced Technologies and Treatments for Diabetes. The conference brings together the world’s leading researchers and clinicians for a lively exchange of ideas and information related to the treatment and prevention of diabetes and related illnesses. ATTD has become synonymous with top calibre scientific programs that have provided participants with cutting edge research and analysis into the latest developments in diabetes-related technology. REACTION partners held a mini-symposium on REACTION (BRUNEL); produced a peer-reviewed abstract with the title "Novel Continuous Glucose Monitoring Techniques within REACTION" (IMM, MSG, MUG); had two poster presentations and two oral presentations (MUG, MSG). The scientific programme can be seen on the ATTD website. MobiHealth 2012 - 3rd International Conference on Wireless Mobile Communication and Healthcare is a conference with focus on mobile communications for the improvement of human health. Two papers have been produced by REACTION partners. Partners CHC and FORTH have submitted a paper which has been accepted for oral presentation at the conference and which will be included in the conference proceedings. The title of the paper is: "Empowering Patients through a Patient Portal for an Improved Diabetes Management". Partners CNET, ATOS and FORTHNET have submitted the paper "Adopting Rule-based Executions in SOA-oriented Remote Patient Monitoring Platform with an Alarm and Alert Subsystem". HSCBB12 is the 7th Conference of the Hellenic Society for Computational Biology and Bioinformatics. 7 dissemination papers related to REACTION were produced, with one winning a best poster award. The TransMed2012 conference is targeted at software designers and manufacturers as well as users of medical information systems. Partner BTS wil be presenting REACTION at the workshop on Translational and Personalized Medicine - Help from Service-Oriented Architectures, Grid, and Cloud. The Symposium provides a forum for the presentation of new developments in the important interdisciplinary field of biomedical systems involving the application of concepts, methods and techniques of modelling, informatics and control of complex biomedical systems. Partners BTS and MUG have submitted a paper. ICML is the leading international machine learning conference, supported by the International Machine Learning Society (IMLS). Partner FORTH-ICS has submitted a paper which will be presented at the conference. The title of the paper is: 'Incorporating Causal Prior Knowledge as Path-Constraints in Bayesian Networks and Maximal Ancestral Graphs'. The scientific sessions provide cutting-edge education and information for all health care professionals. Partners MUG and MSG had a peer-reviewed abstract accepted for the sessions titled: 'Persistent Hyperglycemia in Hospitalized Patients with Diabetes Despite Considerable Operating Expense'. The conference is one of the most prominent forums for Greek and International AI scientists to present original and high-quality research on emergent topics of Artificial Intelligence. Partner FORTH-ICS has submitted a paper which will be presented at the conference. The paper is titled: 'Learning from mixture of experimental data: a constraint–based approach'. The annual Bio-IT World Conference & Expo is a premier event, showcasing the myriad applications of IT and informatics to biomedical research and the drug discovery enterprise. Partner BTS made a presentation titled: A Computational Systems Biology Software Platform for Multiscale Modeling and Simulation: Integrating Whole-Body Physiology, Disease Biology, and Molecular Reaction Networks. SPIE Photonics Europe conference is a conference on metamaterials, nanophotonics, photonic crystal materials, micro-optics, optical sensors, lasers and photonics. Partner IMM had a conference paper accepted titled: A minimally invasive chip based near infrared sensor for continuous glucose monitoring. The ATTD conference is an innovative diabetes technologies and treatments conference for researchers, clinicians and general practitioners in all fields of diabetes, endocrinology and metabolism. Partners MSG and MUG have a poster presentation at the conference titled: 'CLOSED-LOOP INSULIN DELIVERY USING A PHYSIOLOGY-BASED PHARMACOKINETIC/PHARMACODYNAMIC MODEL KERNEL'. Partner MSG has also an abstract accepted for oral presentation titled:'A mobile in-hospital application supporting insulin dosing for patients with diabetes type 2'. MIE2011 is the 23rd International Conference of EFMI - the European Federation for Medical Informatics. The conference will cover various topics in the area of e-health, health informatics, telemedicine etc. There will also be commercial and scientific exhibitions. FORTH, MUG and MSG have submitted a paper for this event. IMM is going to present the REACTION project. The conference's motto and program target on building a bridge from research to application of information and communication technology in health care. Submitted and invited scientific presentations and posters as well as workshops and an interoperability showcase will contribute to that. Although papers can be submitted and presented in English as well, a considerable number of presentations - as well as most parts of the homepage - will be in German, which is the official conference language. Partners MSG, MUG and FORTH-ICS submitted a conference paper titled Design einer mobilen Anwendung für das stationäre Glukosemanagment. Continua Health Alliance is hosting a two-day Personal Connected Health solutions symposium. The symposium will bring healthcare professionals, researchers, world-class companies, entrepreneurs, policy makers, health ministries and other stakeholders together for an in-depth look at a variety of Personal Connected Health solutions and how these tools and services will fit into Europe’s current and future model of healthcare. The symposium will specifically target Chronic Condition Management, Ageing Independently and Health & Wellness topics. On the 18th the SmartPersonalHealth (EC funded) project will held its workshop to discuss challenges and opportunities related to the introduction of personal health systems in routine healthcare, and to consider and finalise policy recommendations for the European Commission. Partner CNet exhibited at the symposium with a poster presentation. The eHealth and Telemed conference is organised by the Royal Society of Medicine with the aim to promote education and research into the development and application of all forms of information and communication technologies for the purposes of improving health care. Partner CHC presented aspects of the Reaction Platform. The conference is the largest UK event focusing exclusively on telecare and telehealth. Partner CHC presented aspects of the Reaction Platform at one of the workshops. The meeting’s goal is to assemble technology developers and users to facilitate creation of new and cost-effective tools—including an artificial pancreas—to help people with diabetes. The meeting will particularly emphasize original data. Scientists and clinicians will have plenty of opportunities to share ideas in both formal and informal settings, and gain insight into how to help decrease the physical and psychological burden of diabetes. Partner SOLIANIS participated in this meeting. A local conference at the Medical University of Graz – Centre for Medical Research (ZMF). The aim of the conference is to stimulate interdisciplinary discussion and it offers the opportunity to researchers to present their results and discuss them. Approximately 250 people joined the Joint ZMF & Doctoral Days 2010 and REACTION partner MUG and MSG did an abstract and a poster presentation on REACTION in relation to improving inhospital glycaemic control. ICT 2010 is a major event on digital technologies in Europe offering conference activities, exhibitions and networking sessions. Partner CNET was selected as one of 20 selected innovative European SMEs to exhibit as part of the SME Village where CNET presented REACTION. 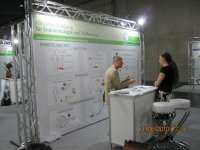 National exhibition on research undertaken by universities, institutes and companies in Graz. MUG exhibited and presented the REACTION project. The event was organised by the Institute for Information Transmission, Problems of the Russian Academy of Sciences, Dept. of the Medical Partner Systems. ALL presented REACTION and discussed the possible use of REACTION application system in diabetes care of the Russian healthcare. The meeting discussed subjects such as (i) methodology of model- and knowledge-based decision preparation and decision support, (ii) the descriptive modelling methods to represent individual health status using the functional information from measuring vital parameters, and (iii) model-based interpretation and evaluation of various medical parameters.